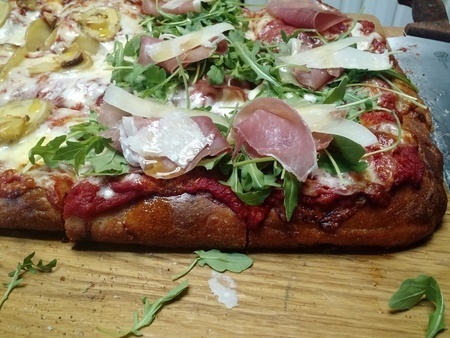 I attempted my first Sicilian style pizza last night. I made half La Regina from the book, and changed it up on the other half for some members of my family (potato & roasted garlic). I'm happy with the results. I used a 12"x18" Allied pan, worked like a champ. Just wanted to thank all the contributors to this site. It's a great resource for home cooks like me, and has, along with the book, changed my weekly family pizza night forever. 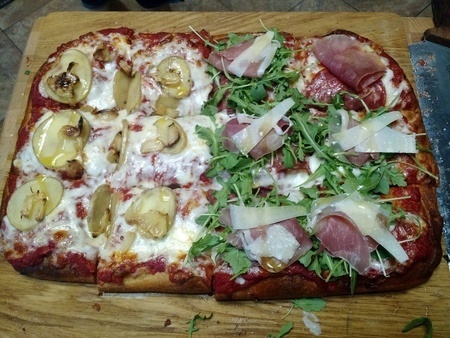 Beautiful Sicilian style pizza. For the potatoes, how did you prep them for the baking? I have yet to make a Sicilian style, but I have made Focaccia bread sticks. My dinner guest loved them, so did I. My pizza night has definitely changed forever as well. I just slice the potatoes as thin as I can and let them cook on the pizza. I tried par-baking them but didn't like the texture as much. The bottom of the crust looks great! Nicely done. Bottom of crust looks great. Did you place the pan on a pizza steel or stone when baking? Yes, I used a steel.